I love brunch as much as the next person, but when I do have a chance to sit down and enjoy, it's almost never in Manhattan. I live in Brooklyn, I'm hungry, and have you been on the NYC subway during the weekend? It takes an hour to get anywhere. But last weekend, I was invited to a pre-NYCWFF brunch at The Breslin given by the nice people behind Urbanspoon. Having heard about this epic brunch and knowing they did just get a Michelin Star, I told my stomach to pipe down and got on the subway. Now, when I say I love brunch, I don't mean yogurt with nuts mixed in, I mean pancakes, sausage, bacon, good hearty "give me a heart attack at 40" food. And The Breslin does some mean hangover, hearty brunch food. 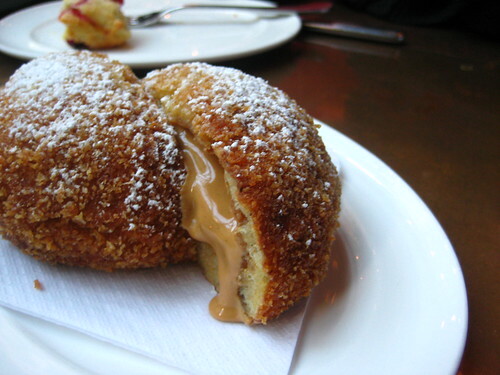 I'll give you the best first, Fried Peanut Butter & Banana Sandwich. Oh yes. Numerous people in my life are now intrigued with this beautiful sandwich. 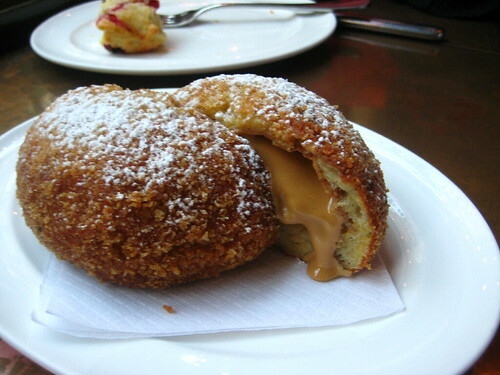 Look at the dripping peanut butter, the fried crispy skin. The adding of bourbon brings this decadence to a whole other level. Elvis would have written a song about this masterpiece. 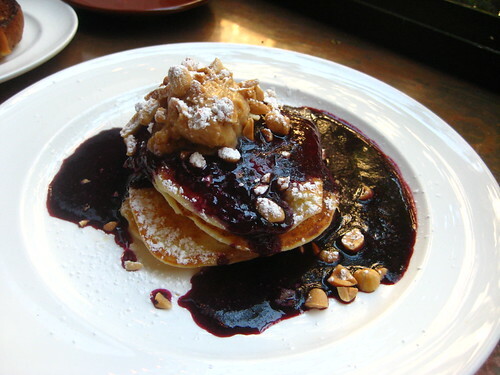 The yin to the fried PB & Banana's yang is the Peanut Butter Pancakes with Concord Grape Syrup. The taste is subtler than the sandwich, but the delicious smell of the grapes and it's own melty peanut butter make this worth it. The sides there (bacon, sausage, etc.) 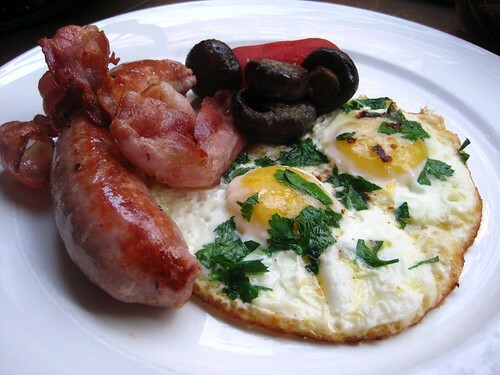 were all salty goodness, but if you want a plate of everything good and holy, you should aim for the full English Breakfast. Get it with a Hot Cross Bun, and you're set. 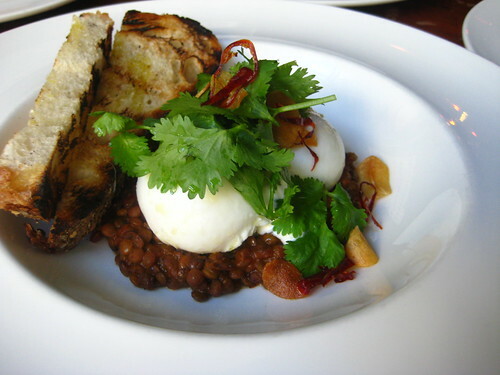 Your token vegetarian can go for the Poached Eggs with Curried Lentils. Perfect poaching, tender lentils, healthy for days. The best part, almost all of the same items are available during their weekday breakfast; feel free to call in sick in order to avoid brunch crowds. damn friend's stupid wedding making me miss this. Wow, rich brunch. Have to check this out.